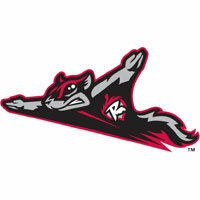 The Richmond Flying Squirrels (24-26) rolled behind right-hander Chris Heston to a, 5-2, victory over the Trenton Thunder in front of 8,732 on Sunday afternoon at The Diamond. The win for the Squirrels marked the sixth straight Heston start that Richmond has prevailed in. In the second inning, the Thunder accomplished something no other Eastern League club was able to do in the month of May. They plated the first earned run against Heston in the month to take a 1-0 lead. Zoilo Almonte opened the inning with a single and advanced to second base on a wild-pitch. Two batters later, Jose Gil notched an RBI single back through the middle to plate Almonte. The Squirrels responded against Trenton left-hander Vidal Nuno in the fourth inning. Tommy Joseph got a two-out rally started with an infield-single. Johnny Monell followed and grounded a ball to the shortstop Yudil Mujica. Mujica misplayed the ball, allowing Monell to reach. Chris Dominguez followed with a single into right-center field that brought home Joseph to tie the game, 1-1. Juan Perez then singled into left field to score Monell for a 2-1 Richmond advantage. Richmond padded their lead with two more unearned runs against Nuno in the fifth inning. With one out, Gary Brown doubled up the left-field line. Ehire Adrianza followed and sent a ground ball to third base. Jose Pirela threw wildly, and his two-base error allowed Brown to score while Adrianza wound up at second base. Joseph notched an RBI single a batter later to extend the Squirrels lead to 4-1. Nuno (0-1) was charged with four unearned runs on nine hits over five innings. He took the loss, walking none and striking out three. Heston (5-2) continued his remarkable month of May by dominating in a different fashion. He registered a season-high four walks, but ran up a career-high 11 strikeouts working primarily off-speed. He was charged with just a lone run over six total innings as he claimed his fifth win of the season. For the Squirrels it marked the sixth consecutive Heston start that they have won. Richmond tallied their final run of the day against right-hander Michael Dubee in the seventh inning. Adrianza tripled to start the inning and Joseph brought him in with a sacrifice-fly. Trenton scored their second run in the eighth inning against right-hander Jake Dunning. Gil drove in the run with a sacrifice-fly. Gil drove in both runs in the ballgame for Trenton, and also their only run on Saturday. Dunning worked two innings of relief for the Squirrels and turned it over to right-hander Brett Bochy in the ninth. Bochy claimed his fifth save of the season with a scoreless inning, fanning Zoilo Almonte to end the ballgame. The series finale is scheduled for 6:35 PM on Monday night at The Diamond. LHP Mike Kickham (3-4, 3.76) will make the start for Richmond against RHP Mikey O’Brien (1-0, 1.29) for Trenton. Pregame coverage will begin at 6:05 PM on Sports Radio 910 and SportsRadio910.com.